West Wycombe House and its 5000 acre estate is the home of the Dashwood family and has been since 1698. The first Sir Francis Dashwood built a house on the site, although barely any of this original house is visible, as it was incorporated into the extensive remodelling of the house undertaken by his son the second Sir Francis Dashwood. 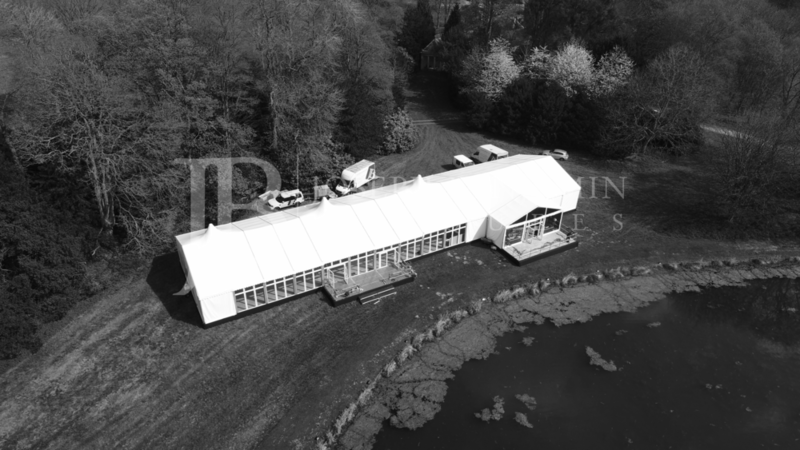 The clients were aware that it was going to be challenging to keep a good atmosphere with only 100 guests but at the same time have an impressive grand structure to sit proudly in the grounds of West Wycombe Estate, Buckinghamshire. They also wanted to have an intimate feel to the dining area and embrace the fantastic views over the lake. In order to achieve this Joseph Benjamin created an internal dining room with guests moving into a nightclub area later in the day. By creating a long dining area it maximised the view of the lake and grounds throughout the day. 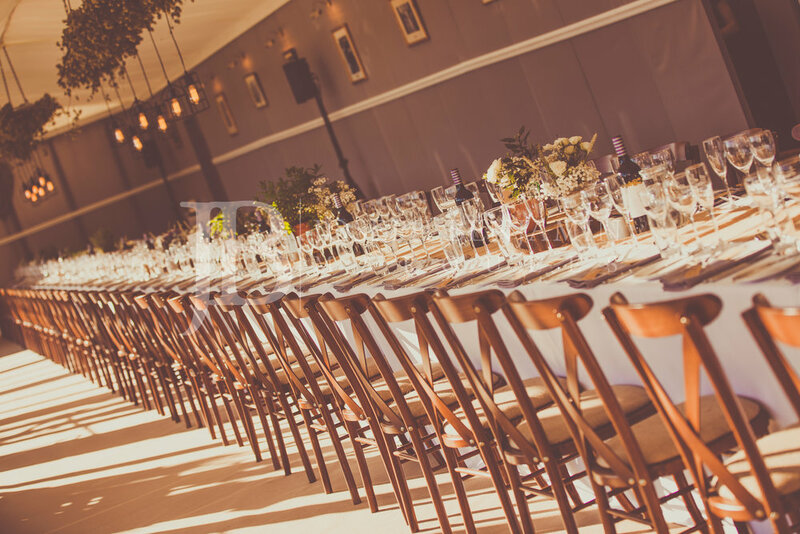 The intimate dining area was created using single-use tack off lining, wooden architrave and skirting, personalising the marquee to the desired taste with pictures and picture lights. The glass panels allowed guests views across the lake and back up towards the main house. The loos were built in to the matching décor of the dining area and access was created through internal doors. The nightclub featured a central custom-built round dance floor which was highlighted by the full width stage, half round bar and full height panoramic windows overlooking the lake with access to a decking area. 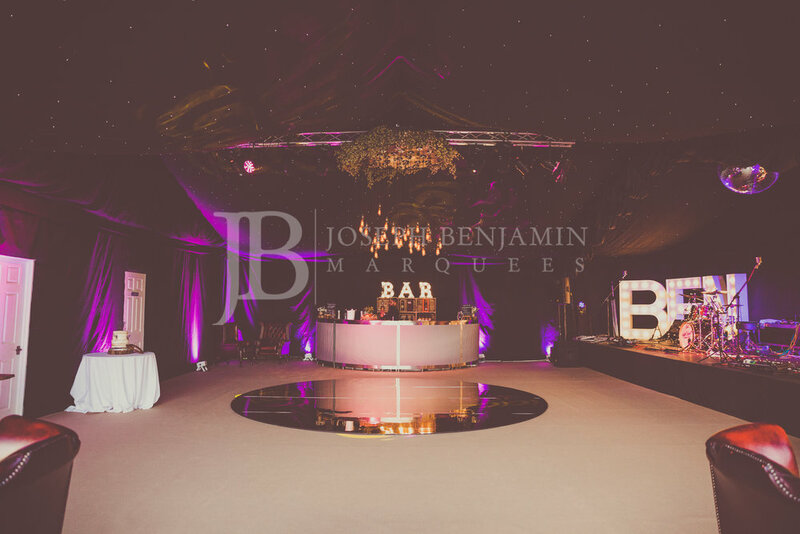 "Right from the outset we knew that you were the right company to use to provide our wedding marquee. We came to yourselves with an idea and you guys made it better than we could have hoped for. Your whole team were a pleasure to be around and so helpful. The marquee was just perfect and your attention to detail was amazing. Everyone couldn’t stop talking about the round dance floor. I will highly recommend you to everyone. Thank you both so much!"